You can now download Margaret Weis' The Lost King for only 1.99$ here. These space opera books were a big hit when they were published inthe 90s and I've always had a soft spot for them. 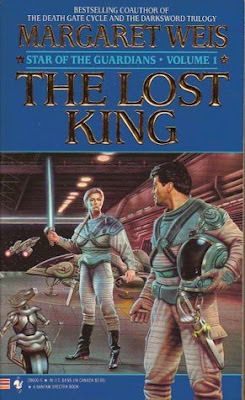 They've been described as Battlestar Galactica meets Game of Thrones, and I guess that's a good description. A galactic revolution has toppled the Starfire dynasty, and swept into power the harsh Democratic Republic. To support the murdered king is now punishable by death. But on distant worlds, the few surviving Guardians carry a dangerous secret: Somewhere in the galaxy, they shield the rightful heir to the throne. Stalking the hidden king is the warlord, a ruthless Republican general who wields the bloodsword. Only a few brave rebels dare to oppose him: young Dion who fights to find his destiny: the mercenary Tusk, the outlaw commander Dixter, and the beautiful Lady Maigrey, the only person alive who can match the the Warlord's cunning. Theirs is the ultimate battle against a star-spanning corruption – the ultimate sacrifice for the glory of the lost king's throne.